"It's great for the environment and it's a good life for the worms." “The Worm Lady” What started out as a hobby quickly became a passion. Joan O’Connor has been vermicomposting since 1992. She raises and sells worms and educates the public on composting worms as an earth-friendly solution to recycle kitchen waste into a fertile garden additive. 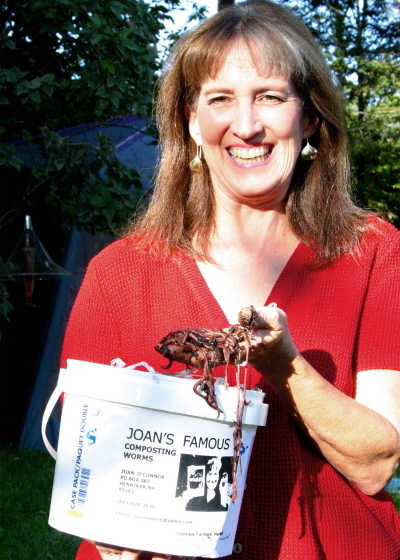 Joan is a strong advocate for recycling and has been featured in local and regional newspapers, magazines and TV. For 21 years Joan started out her career selling on the road as a Manufacturers Representative for jewelry manufacturers, importers, designers, craftspeople and artists! She also sold supplies to florists and gardeners, and has also been an avid gardener. She serves on the Board of Directors of the Northeast Organic Farming Association of New Hampshire (NOFA-NH) for many years. She volunteers for the Henniker Recycling Committee, the Henniker Garden Club, the Henniker Historical Society, Henniker Azalea Park Committee, the Monadnock Herb Society, and also participates in various area Farmers’ Markets. In the last eight Winters she is the Founder/Director of the Concord Winter Farmers’ Market and recently the Tilton Winter Farmers’ Market working with AutoServe Dealerships and Tilton Farmers’ Market working with the Tanger Outlet Center for the locations. Joan lives in Henniker, New Hampshire in a one room, renovated schoolhouse that she shares with her cat, dog and worms! Whoa! These worms eat your garbage!